*** Event host, Leon Tafoya presented "Life and Times In San Fidel NM"
In 1766, a boy of 8 named Mariano Jose Sotero De La Pena came from Mexico City to what today is New Mexico. He settled at Pajarito, near Albuquerque, and his son Rafael De La Pena was born in 1800. Rafael moved to Seboyeta in 1836; his son Pablo was born in 1847. Pablo and wife Benita moved to San Mateo in 1862. A son, Abelicio, was born in 1874. Abelicio and wife Manuelita had 6 children. He acquired extensive ranchlands, but died in 1918 at age 44. His son Pablo Pena, age 20, was in school in Santa Fe. He returned to San Mateo to help his mother run the ranch. Pablo and wife Pablita Marquez raised 5 boys and 2 girls. The Pena Ranch was finally sold in 2003 to the Fernandez Company (Floyd Lee Ranch). In 1964 Pablo and Pablita moved from San Mateo to Grants. They owned the Starlight Cafeteria & Lounge. Pablo Pena was very interested in politics; he served 4 terms as Valencia County Commissioner between 1928 and 1950. The Moleres Family: Pablo's son Eddie l. Pena (Paul's father) married Marie Moleres in 1954. Decades earlier, in 1916, Jean Baptiste Moleres left the French Basque Pyrenees area for America. By 1918 he was a partner in the Carrica sheep company, whose 'Navajo Ranch' at Hospah was the winter sheep range. The summer range was at 'Cerros Ranch' near the Ice Caves. Each fall they herded the sheep 90 miles north from Cerros to Navajo for the winter, and returned again in spring. Paul's grandmother-to-be Marianne Arrossa, also a Basque, worked in Paris. Her brother Jean brought her to the US; she married Baptiste Moleres in 1928. After 39 years of sheep ranching, in 1957, Baptiste and Carrica split their lands and livestock equally. Marianne Moleres raised 3 boys and 1 girl, Marie (Paul's mother). Devoted both to her children and her Church, she taught First Holy Communion classes for 30 years. This was no small feat as she spoke only Basque and French; she learned Spanish with Baptiste, and the children taught her English. Marianne Moleres became a US citizen in 1950, as did Baptiste, in 1958. By the 1960s, sheep gave way to cattle. Baptiste was always happiest at the ranch, no matter how difficult or how cold and windy it was when herding sheep across their ranch lands. Eddie Pena, Paul's father, was born in San Mateo in 1931. He grew up working on the ranch, and graduated from Grants Union High School in 1951. Marie Moleres, Paul's mother, was born in Albuquerque in 1931. She also grew up in Grants, graduating in 1949. Both were loyal fans of Grants Pirate teams for 62 years. In 1957, Eddie opened the Day & Night Launderette in Grants. In 1972 he ventured into Cable TV and in 1980 he purchased KMXN-TV in Albuquerque. Eddie had several other businesses before he passed in 2012. Eddie and Marie Pena raised 11 girls and 3 boys, between 1955 and 1974. The family comes together every year for the 4th of July, and at Thanksgiving. 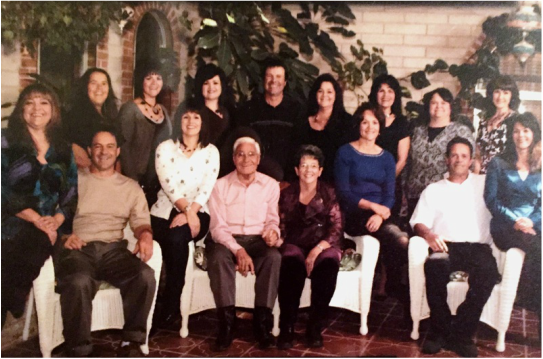 As the son of Eddie l. Pena and Marie Moleres, Paul is of the 7th generation, and two more younger generations make 9 generations of Pena's in New Mexico. *Today there are 103 descendants of Pablo and Pablita. From an 8 year old boy coming to New Mexico in 1766, the Pena Family has lived within 100 miles of Grants for 249 years. The Spring Event speaker was Matt Allen, of Mt. Taylor Manufacturing, located west of Milan on Old Route 66. Mr. Allen operates the business with his brother Hardy. He gave an absorbing talk on the early years for the family and the business. Begun with local economic development funds, it is the only business in the county to succeed and continue to serve the region for 50 years. Mt. Taylor Millwork was created in 1965 by Jack Hahn and Ted Allen, who grew up in French, NM, now a ghost town near Springer. Ted had a degree in Forestry from Iowa State. He came to the western forests of New Mexico and Arizona to practice his profession, and soon met his life partner, Patricia - a nurse who'd come to Arizona from Winnipeg, Canada. The Allen family came to Cibola County in the 60's, to start a business to produce specialty wood molding and millwork products from the region's forests. This dream was enabled by the local "Industries for Grants" funding program. However, the uranium boom of that era was a challenge for a non-mining business; Mt. Taylor Millworks had to hire 125 men in one year just to keep 25 working steadily. Matt Allen has worked in other fields such as construction and cost estimating. At 19, he first went underground as a miner. But in 1987, Ted asked his son to come back to the family business. Matt was soon working at the plant, married, and raising a family. In 1990, his father won the first Jimerson Award for Excellence in producing specialty wood products. However, as time went on, foreign rivals were cutting into the market, and profits declined. By 1999 Mt. Taylor Manufacturing had added a machine shop to serve mining and drilling firms. The molding plant later closed, and a sawmill and pellet mill became the new focus. The Forest Service had begun to contract for watershed restoration projects in the Zuni Mountains, which is ongoing today. Providing "Talented Milling of Wood and Steel," the Allen family business now offers rough green lumber, certified "engineered wood fiber" playground chips, garden bark, and animal bedding, plus fuel pellets made from sawmill residue and clean recycled wood. Dean Coleman spoke on "The Greek Influence In Grants"
On February 14th, CCHS held its spring quarterly public history session, "the Greek Influence in Grants," at Double Six Gallery. This was a fascinating discussion for those not too distracted by the day's Mt Taylor Quadrathlon, or, Valentine's Day events. The speaker was Dean Coleman, a local resident for more than 60 years. Dean has a fascination with area history - one example is the 'Mystery Stone' on Highway 6 near Los Lunas. He is the son of George Karvouniaris, born in 1891, who as a young man traded hemp cargoes between Greece and Egypt. He came to America in 1907 to escape political strife, Anglicized his name, and first settled in Oklahoma. Dean recalls that his father learned English by reading comic strips like Maggie and Jiggs, and the Katzenjammer Kids. Greek families found many opportunities in the West, including restaurants and hotels, which brought the Colemans to New Mexico. In 1955, Dean's family started the Hollywood Diner in Grants (photo above), which drew many actors when movies were being made in the area, such as Joel McCrea, when filming Four Faces West. at El Morro. Over the years, he met Ben Vereen, David Jansen, Glen Campbell, and Ben Jonson in the restaurant - as well as Navajo Code Talker Carl Gorman. And in 1958, big city reporters lined up to use the restaurant's pay phone when Mike Todd's plane "The LIZ" went down in the Zuni Mountains. The family also was involved with the Western Host Motel for more than 40 years. A second speaker, George Hantzopolous (or Hanges) could not attend due to health issues. His family operated the Royal Cafe. 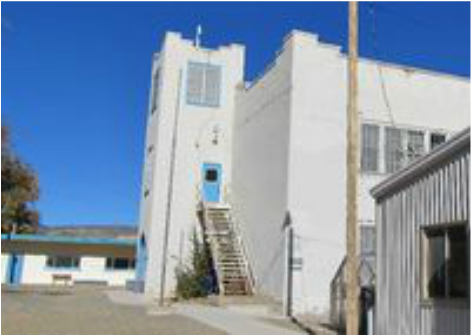 Other notable Greek names in Cibola County include George Ade, who built the Lux Theater, and who also ran the Yucca Hotel, where the former Latham's store now stands. In the 1930's he was considered by many to be the 'unofficial mayor' of Grants. Also, Pete Chalamias managed the Country Club for many years. For the rest of the meeting, the group remembered the many old, long-gone businesses along Santa Fe Avenue, and their owners - and more recent fates. This conversation was very dynamic and really energized the entire audience, most of whom have local roots going back 40 years or more. It wrapped up a very successful history presentation. 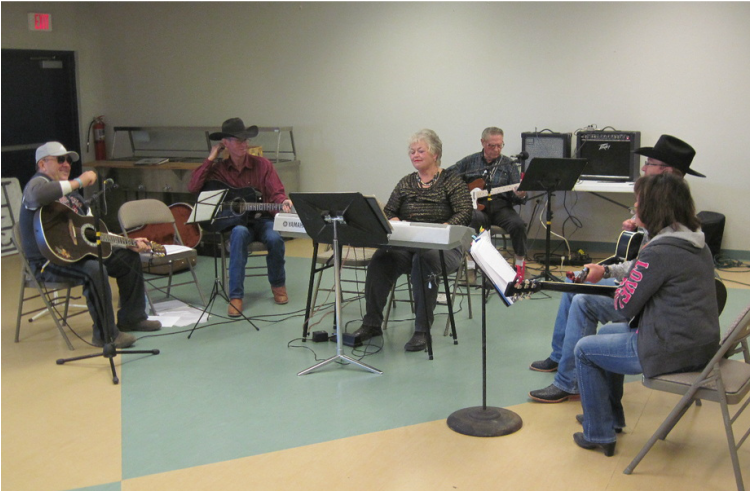 By "The Cousins Group" from around Cibola County - and beyond! 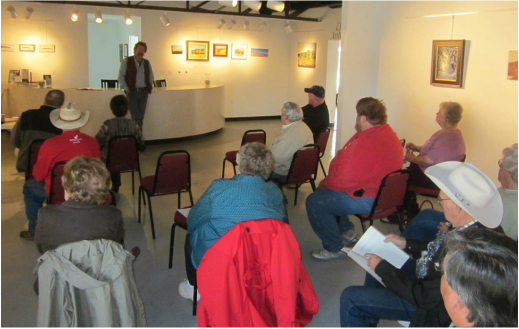 "How The Willcox Family Came To New Mexico"
Estlee Willcox Dominguez, a geneaologist from the Ramah area, gave a fascinating in-depth family history to an audience of more than twenty Society members and friends at Double Six Gallery. The Willcox family history spans more than three centuries. Thomas Henry Willcox, born in 1689, came to England's American colonies in 1713. Thomas built one of the first paper mills in the colonies in 1729, at Glen Mills, Pennsylvania. He made special papers for early colonial and later United States currencies. Willcox is said to have provided special papers for a good friend, Benjamin Franklin - a given name that has endured in the family down through many generations. The family grew and prospered in the 1700s as the colonies became the United States. The Willcox family branches spread slowly through the Cumberland Gap into North Carolina and then Georgia, and by 1880 some had moved west into Texas. A generation later, in 1920, Jason Emmet Willcox with one family member from Loving, Texas traveled by rail to Thoreau, New Mexico. They walked through the Zuni Mountains to the El Morro Valley, where homestead lands were available, and they found sites that they would later claim. In late 1921, the Willcoxes returned with their families to El Morro by wagon train - a 35 day trip. That first winter, the families lived in tents, and after building cabins in the spring of 1922, the men went back to work in Texas to earn money to improve on their land claims. They returned and settled for good in the fall. Much of the Willcox homestead lands, in beautiful Inscription Rock Valley, eventually became parts of the El Morro National Monument, as did some of their early buildings. The Willcox Cemetery at El Morro is still maintained by the family. The El Morro Valley grew over time to nearly 300 families; Estlee's grandmother Ida was a midwife who delivered 88 babies. It was a bountiful area and a good life even in the Depression years. Farming and ranching enabled the Willcoxes to prosper in the Ramah area and the Zuni Mountains. At one time a Willcox sawmill in the Tinaja Valley shipped lumber to the Breece railhead at Grants. In more recent years, Willcoxes are found across the West, some still here in New Mexico and others working in many fields and in many states. The Willcox (or Wilcox) family has spread far and wide, but their roots in the Ramah-El Morro area still are strong. "The Coming of the Franciscan Fathers"
Antonio Trujillo, a former Franciscan, was Pastor of the Acoma and Pueblo Missions for four years. He discussed centuries of Franciscan history and spirituality in the Southwest - a diverse region with historic and cultural roots. He cautioned that History is always subjective - it reflects its time, and, the experiences and beliefs of the authors. Trujillo discussed growing up in the village of San Rafael, and recalled how the Franciscan priests and brothers shaped his youth and inspired him to become a priest of the order. The life of Saint Francis of Assisi has guided the order and many people to appreciate their faith by recognizing God in creation and each other. His simple, down-to-earth philosophy of humble service to the flock has been its hallmark. The Franciscans came to the New World with Columbus at a turning point in history, when Spain had just overcome centuries of Moorish rule. Until the conquest of Mexico, Spain was a very poor land. As new wealth flowed back from the Americas, priests were sent with the explorers to evangelize converts to Christianity. As lands were settled, Spanish villages grew up around the central church plazas. A key issue was to bring the Catholic faith to all people. In 1598, Juan de Oñate led colonists north from Mexico. As Governor of the new territories Onate sent a group of soldiers to Zuni Pueblo. On their journey they made a stop at Acoma where a battle ensued. All the Spanish were killed, including the nephew of Onate. Onate sent soldiers again to the pueblo. A second battle led to the massacre of at least 300 people at the mesa-top village. The Acoma men who survived the massacre where taken to Santa Fe for trial; Onate found them guilty and ordered that all under 25 have their right foot amputated. The Franciscans reported this horrific incident to the Viceroy in Mexico City. Onate was tried and found guilty of atrocities against subjects of the crown, dismissed as Governor and ordered to return to Mexico. Thirty years later in 1629, Friar Juan Ramirez was sent to build a mission at Acoma. When he first arrived, a small girl fell off the high mesa and as she fell, Fr. Ramirez caught the girl and saved her life. This incident allowed Fr. Ramirez to build the largest Mission in the Southwest. Not only were the great timber beams brought from Mt. Taylor, but all of the rock and soil to build the church were carried up onto the mesa by the faithful. In the Pueblo Revolt of 1680, San Estevan Mission of Acoma was the only church not destroyed. Since the Pueblo Revolt, there has been a mutual respect of both the Pueblo and Catholic practices. Both have similarities among their traditions. They both have religious leaders, both use song in their practices, both have religious lents, pilgrimages, and prayers. Because there is common ground, there has been a marriage of both traditions in most Pueblos cultures. This can be seen in the celebrations of their Feast Days where both cultures are celebrated in the Catholic Mass and Traditional Dances. In closing, Trujillo noted humility and respect of others as core virtues. Only when we can listen to each other with open hearts can we respect each other. There is a Spanish saying, “there is a reason why God gave two ears and one mouth”. Antonio Trujillo and his wife Lucinda own and operate the Guadalupe Vineyards in San Fidel, New Mexico. Antonio was a Franciscan for seventeen years, and currently serves as the administrator of St. Joseph School in San Fidel. Two of Mr. Torrez's most recent books were very popular with those attending the event! Robert Torrez served 13 years as New Mexico State Historian (987 to 2000). He has continued his research, lectures, and writings on various aspects of New Mexico History. 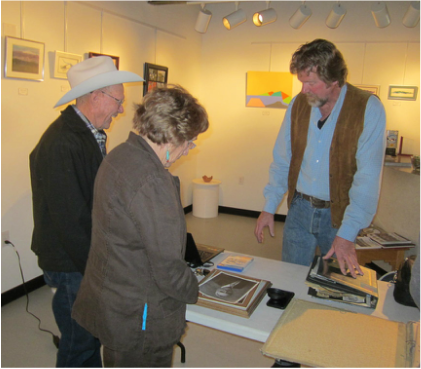 He serves on the Speakers Bureau of the Historical Society of New Mexico in Santa Fe. Mr. Torrez, a prolific author and excellent public speaker, held the Cibola County audience spellbound with his discussion of the formal judicial system of New Mexico Territory. Much of his research for the recent book "Myth of the Hanging Tree" has revealed that popular fiction and film has sensationalized the public's idea of 'frontier justice' in New Mexico. For instance, horse stealing was NOT a hanging offense in New Mexico; only first-degree murder was. Torrez points out that historically, the Territorial era was significantly more likely to impose capital punishment than had been the case in the Spanish colonial centuries. However, his research also shows that lynchings were far more frequent than legally imposed sentences of hanging, by a Territorial judge. Nearly half of all lynchings did not involve a tree (a rare resource in much of the state!) Between 1849 and 1908 there were 51 legal hangings but more than twice as many lynchings. Many such death sentences were quite eloquent, even colorful, in their pronouncements upon the guilty - and predictions of their fate in the afterlife. Torrez notes that while a Territorial Judge was bound to hand down a death sentence if the jury so decided, the actual execution depended on the Governor's death warrant - or, possible pardon or commutation or even pardon. 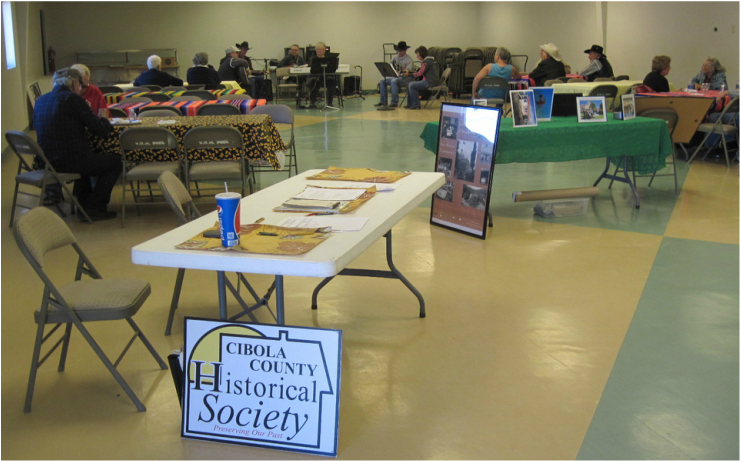 *Thanks to the New Mexico Humanities Council for enabling this program to be presented in Cibola County!